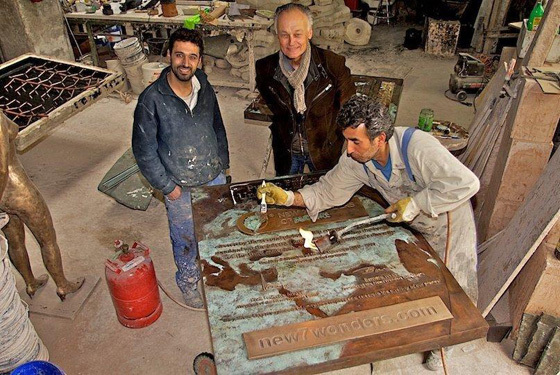 Bernard Weber, Founder-President of New7Wonders (centre), with Aslan Göktepe (left), as Hasan Göktepe (right) of the Kunstgießerei München applies the patina to the Puerto Princesa Underground River plaque. The Official New7Wonders of Nature Inauguration ceremonies for the Puerto Princesa Underground River (PPUR) will take place in the Philippines at the weekend. A highlight of the event will be the unveiling of the commemorative plaque on Sunday at the PPUR site on the island province of Palawan. With the countdown clock running, the final touches were applied to the bronze plaque in the Kunstgießerei München, the foundry in the heart of Munich, Germany, where it was cast using a combination of art and craft that dates back to ancient times. All the skills of the Göktepe foundry family can be seen in this video clip, which was produced by Bernard Weber and shot by Steffen Dubouis.